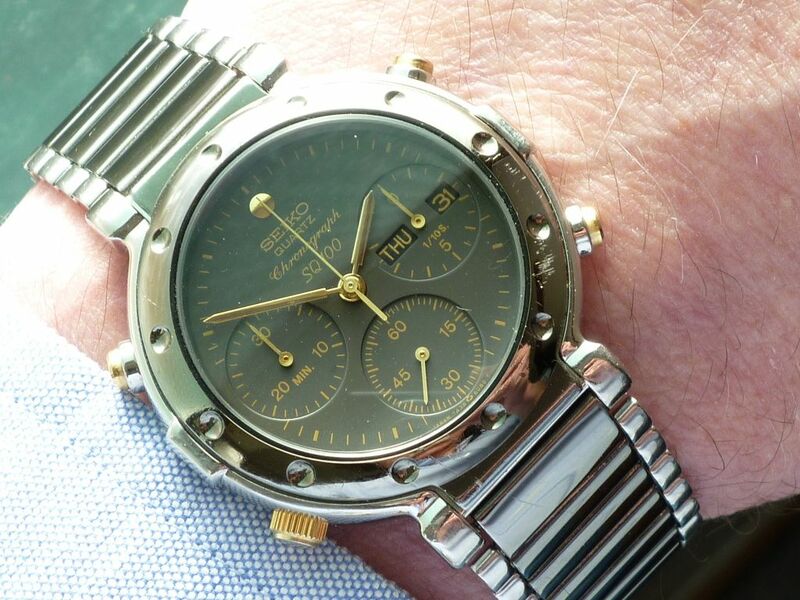 What do you think of this Seiko 7A38? I think it's uncommon. 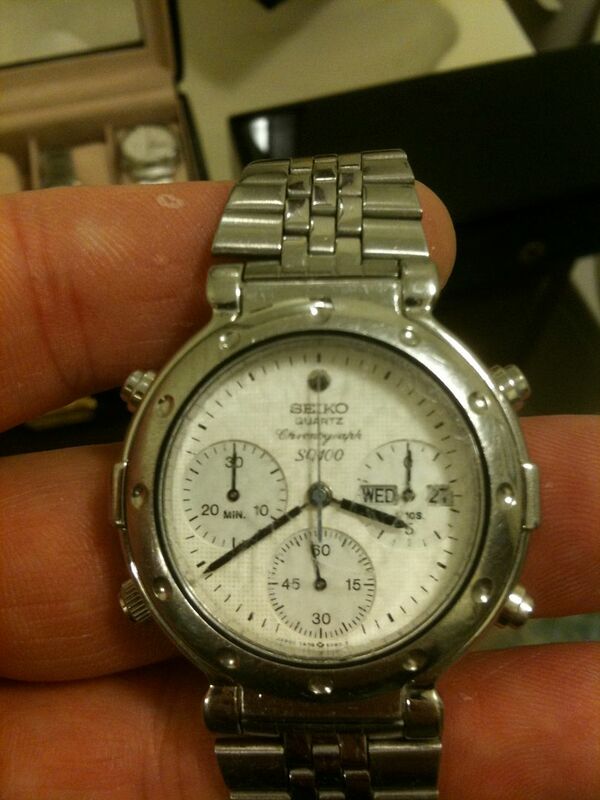 Seiko 7A38-6090 Un pezzo poco conosciuto. Mi limito a trasmettere, ai posteri , le foto di questo non comune 7A38-6090. Si tratta di un modello poco noto e sul quale la rete è avara di informazioni. 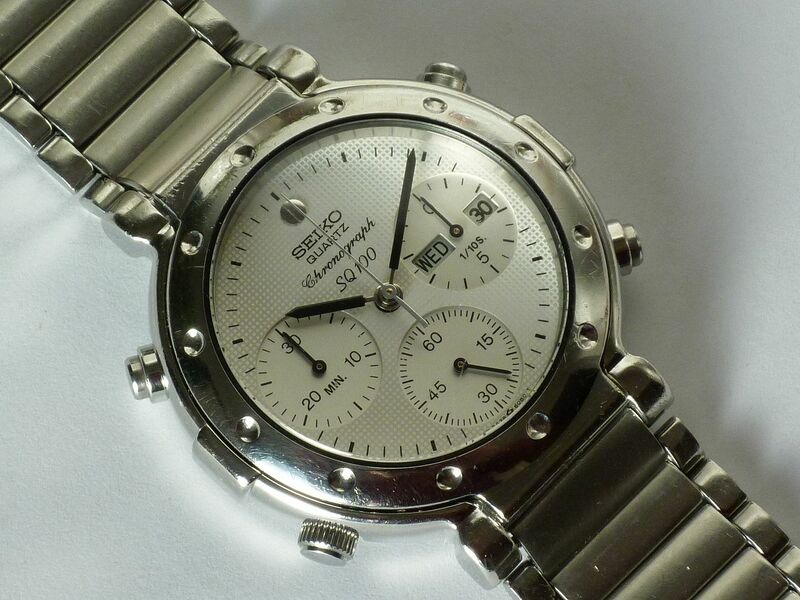 Design tipicamente '80 (l'orologio è del febbario 1988). Dichiarato impermeabile fino a 10 BAR. Quadrante argentee, con una bella lavorazione a "griglia". Particolare l'indice a disco "solare" a ore 12. Hi, Manuel. Thanks for posting this - it was the wake-up call I needed. I had actually started a topic on this model over a year ago - or at least I had reserved 4 posts for it - but never done anything more. So what I've done is copied my original topic title over to your thread, and copied and pasted your first post from Orologi & Passioni. I hope that's O.K. with you. 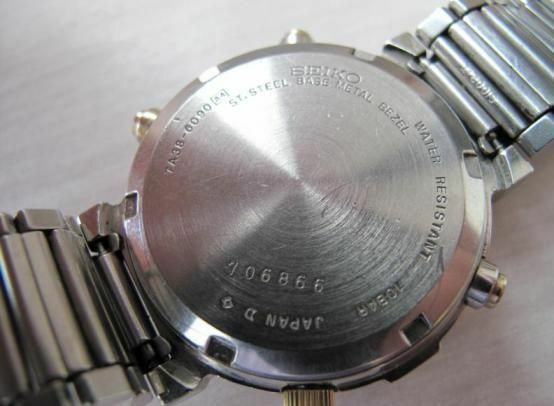 The stainless version of the 7A38-6090 SAA115J is the least commonly found variant. I have one in a similar condition to yours. 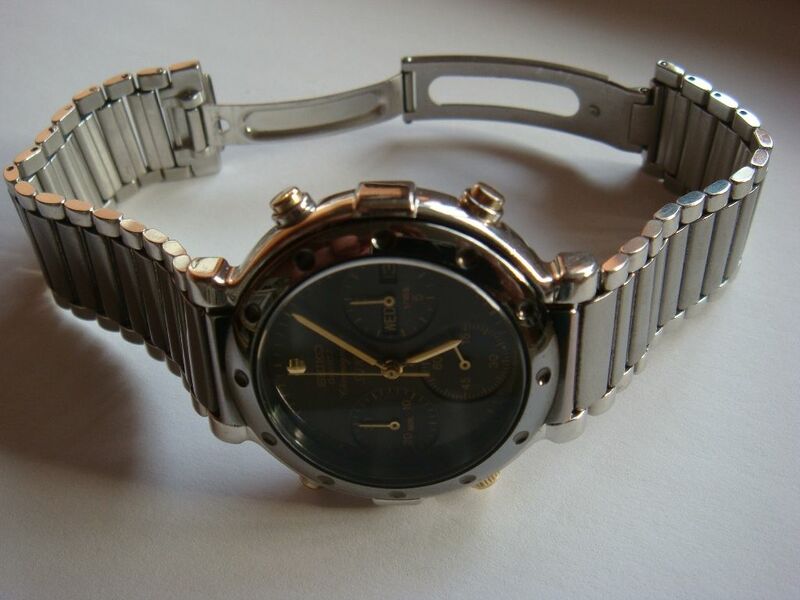 and the stainless / gunmetal two-tone 7A38-6090 SAA117J, which is the most commonly found variant - usually on eBay Germany. However, before I go any further, I should point out there is, theoretically, another even rarer 4th version of the 7A38-6090 - SAA134J. I say 'even rarer' because up until now, I still haven't seen ever one myself. 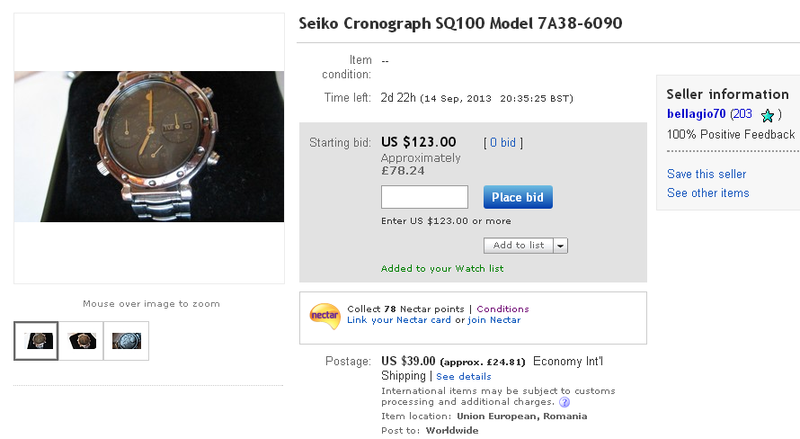 But according to Seiko Oceania's database, it does exist. 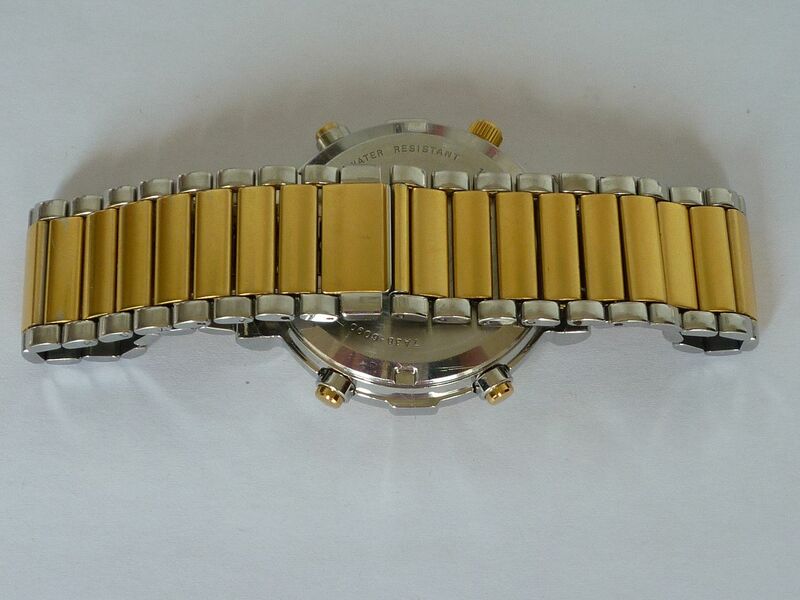 The case material finish is shown as: THC.MGP (Top Hard Coated - Middle Gold Plated) and the bracelet is a different p/n - S1002D. 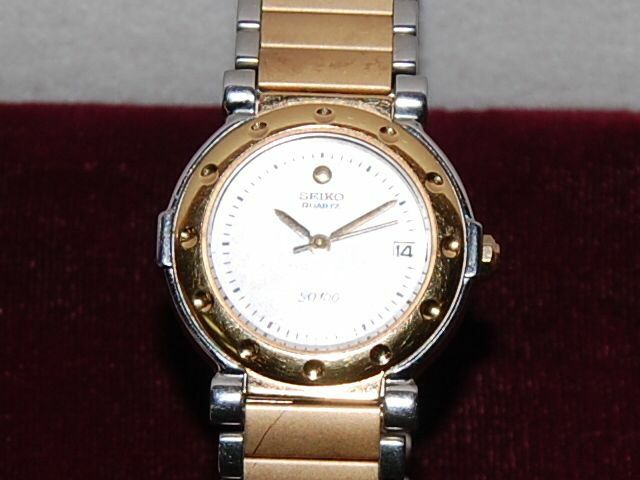 So it's presumably a gunmetal / gold two-tone with a creamy-white dial. Sounds a little odd. 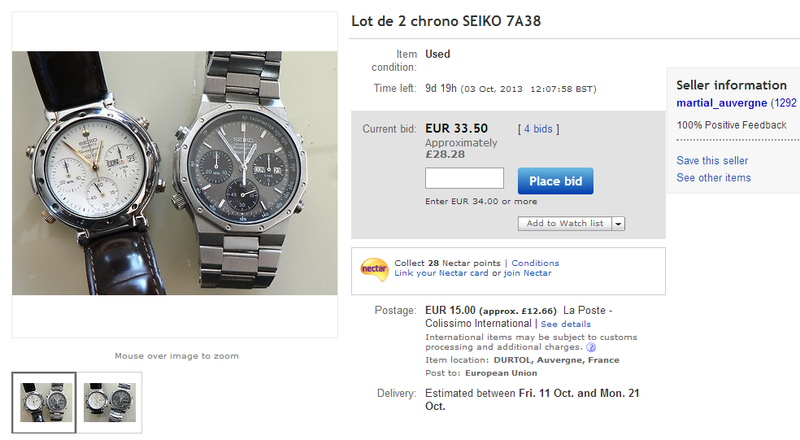 Maybe Seiko never actually produced it. 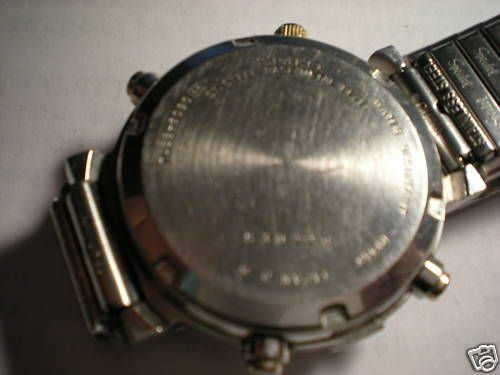 Note Hermann-Josef's statement: Although searching the internet for many times, I couldn't find anything about this watch. 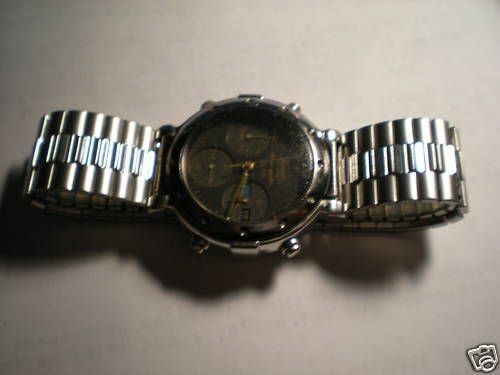 I bought my very first 7A38-6090 - a stainless / gunmetal two-tone version, from a US eBay seller, a few months later in October 2009. It wasn't the best example, not by a long way - but it was the first that I'd seen on eBay, so thinking they were 'rare' - I pounced on it. 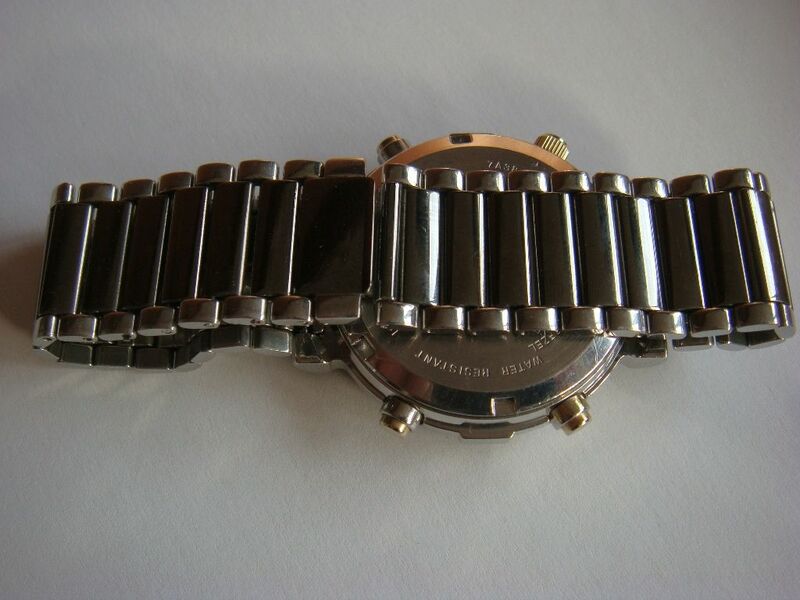 Apart from having a badly scratched crystal, it was missing its original bracelet, fitted with a Spiedel Twist-O-Flex band, that had been trimmed down (badly) at the ends, to fit the 14mm lug width. 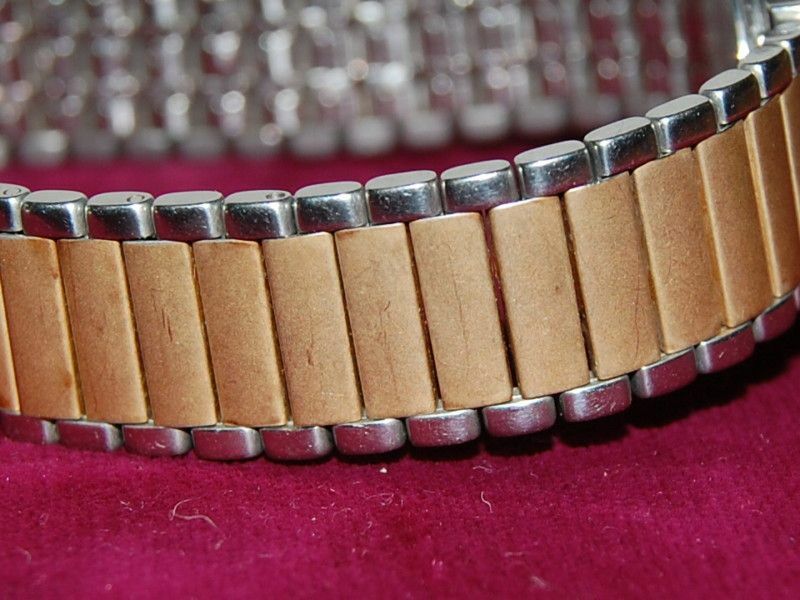 Still I'd only paid $22 - and when I complained to the seller about how the bracelet had been fitted, he kindly sent me another F.O.C. !! 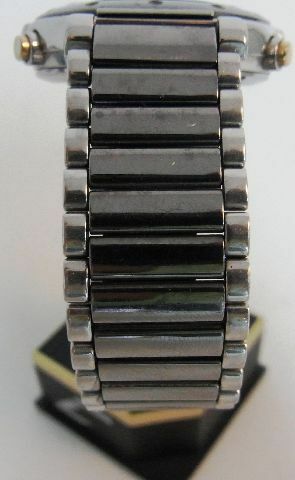 For a while, I'll admit I did actually contemplate buying a 5P32-6A40, to rob it of its p/n G1237H bracelet. 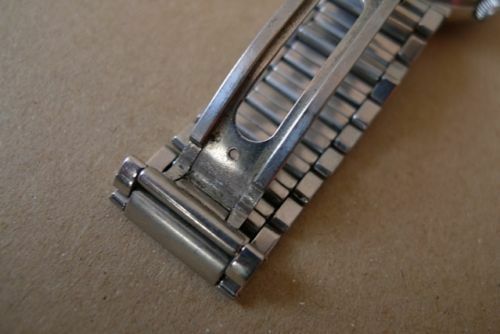 Apart from a slightly different Z-fold clasp used, its overall design is almost identical to the 7A38-6090's p/n S1002H bracelet - and it's also a 14mm lug width fitting. As things turned out, I never did. 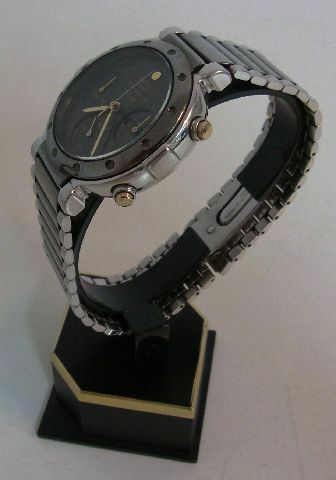 Like they always do, a better example of the same 7A38-6090 turned up on eBay Germany. 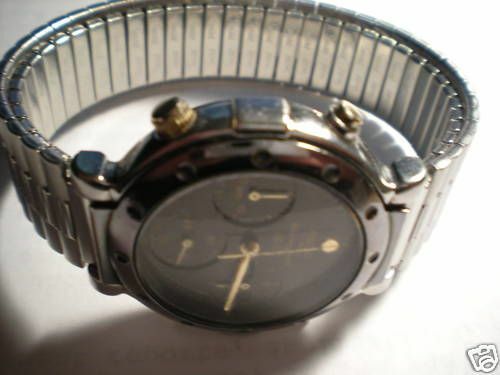 My first one got broken up for parts - mostly for the movement with its unique gold on black lettered day / date wheels, which are only used on this particular model 7A38-6090 SAA117J. 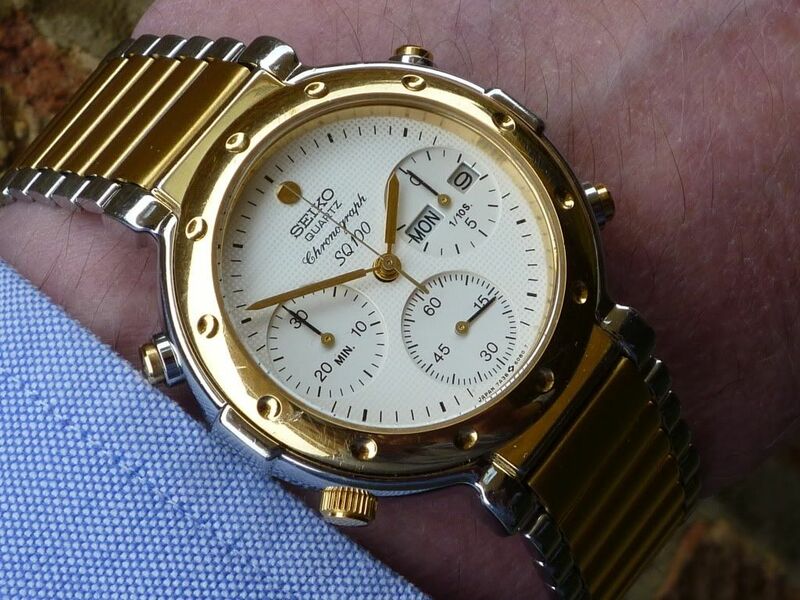 Odd when you think about it because there are quite a few 7A38's with black / gold dials. Besides, by mid 2010, I was beginning to see other much better examples, so I knew they were out there, waiting to be found. 7A38 New Arrival Anyone (NOT PAUL) know what it is????????????? This arrived a couple of days ago and after fitting a new glass is ready to go away with my other 7A38's. 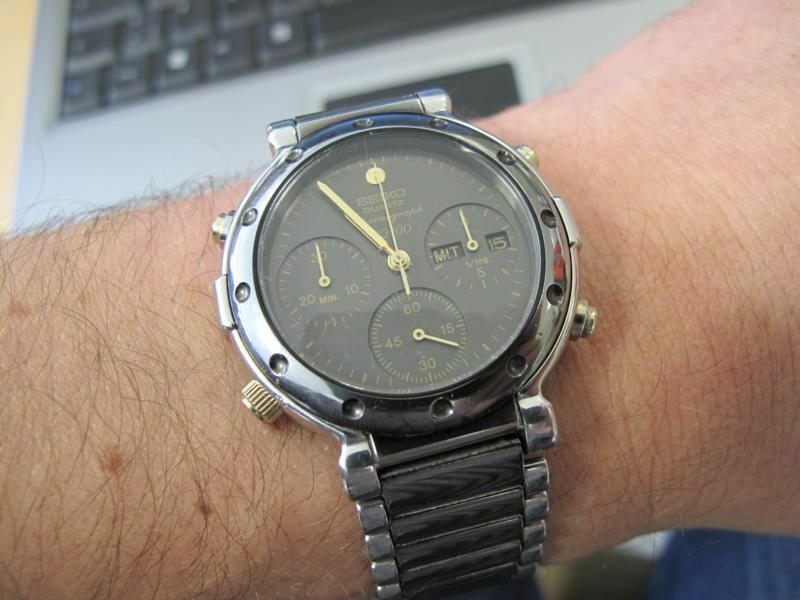 Paul (SEIKO7A38Fan) has already seen the pictures and knew right away what model 7A38 it was, he has his own! I've not seen this one before and didn't have a clue what it was!! 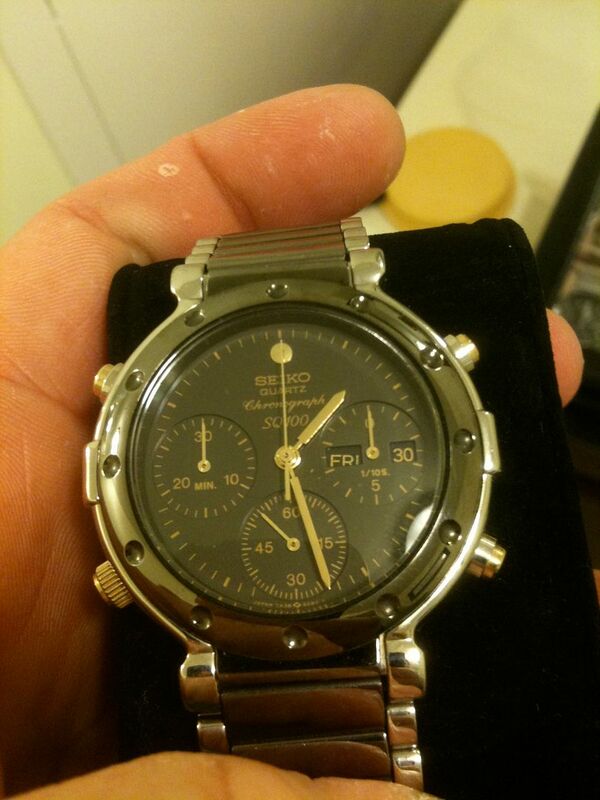 Anyone seen one or know which model number it is? 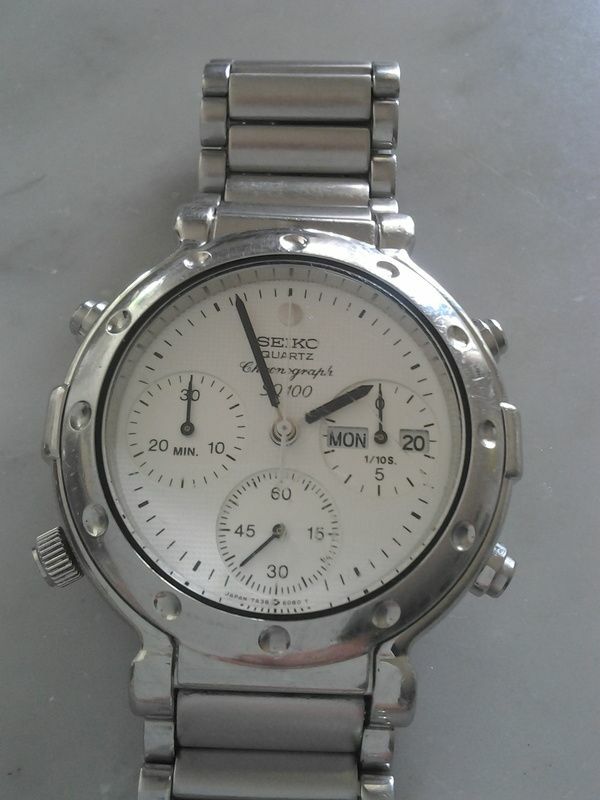 Never having been that happy with my own previous example, I bought another on eBay Germany in August 2011. 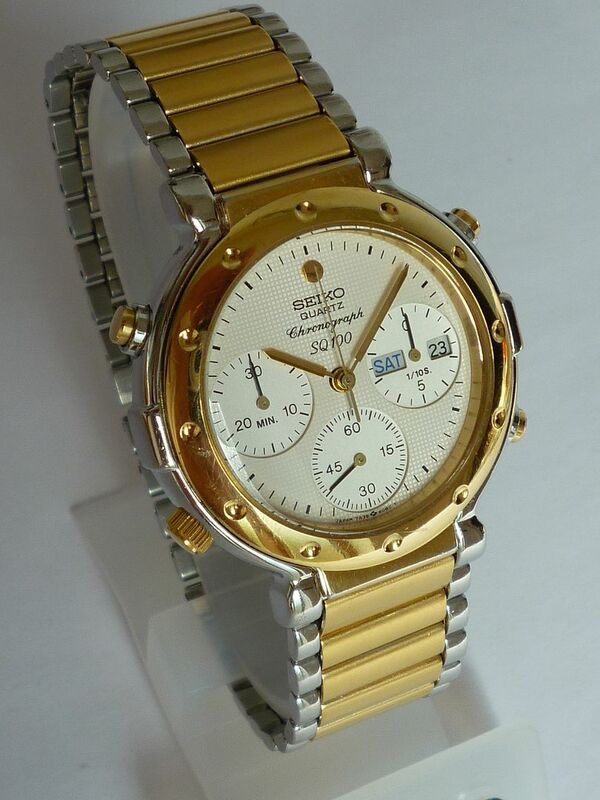 With the two-tone stainless / gold plated version, I did my usual daft trick - buying the first one I ever saw. Actually worse than that, I deliberately bought the first two I saw (within a week of each other) in March 2011. However, this time it was completely intentional. According to my records, the one from the States cost $59 and that from Germany 30 Euros, including shipping, total approx. £77. 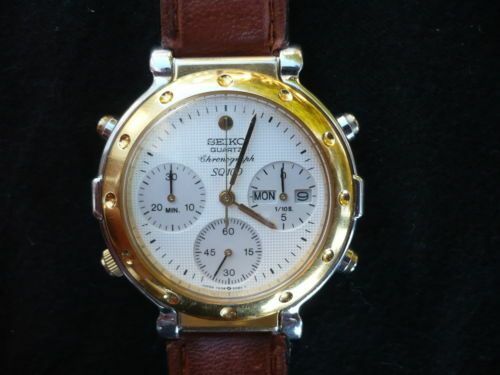 That one was purchased by 'Paul66' on RLT (a.k.a 'BlackCab' on this forum). 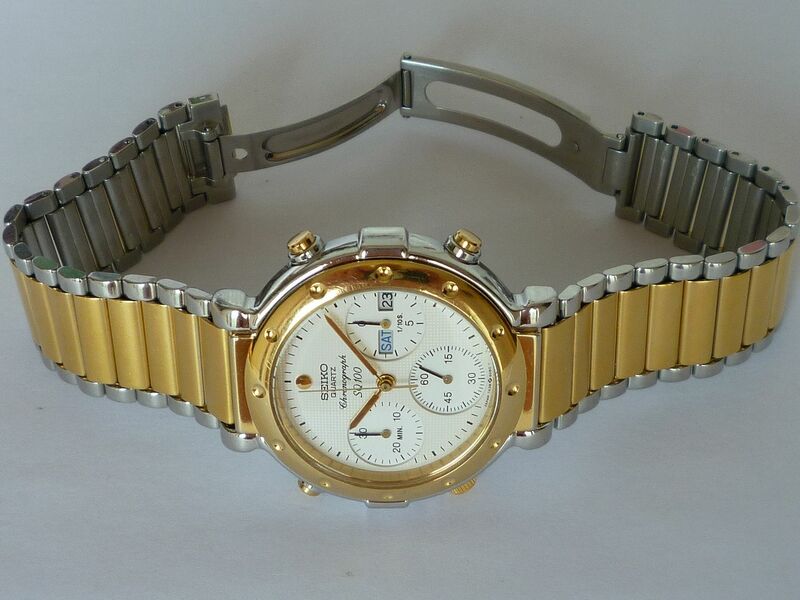 The stainless / gold-plated two-tone 7A38-6090 is less common than the stainless / gunmetal two tone, so don't crop up on eBay very often. It wasn't until January 2012 before I saw another. I didn't keep any details of the listing, nor the price it sold for. Just this photo. 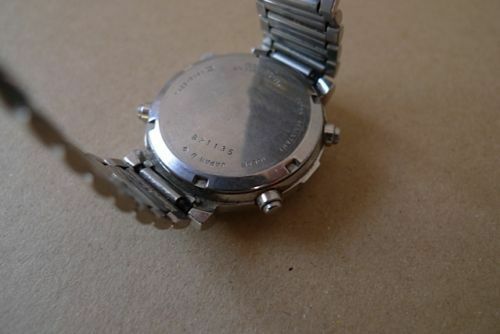 The watch head looks in nice cosmetic condition, but it was missing it's original bracelet, fitted with a leather strap, notched to fit. Presumably it's the same 7A38-6090 which was posted here, more recently on Ceasornica.ro by 'Bonheur'. 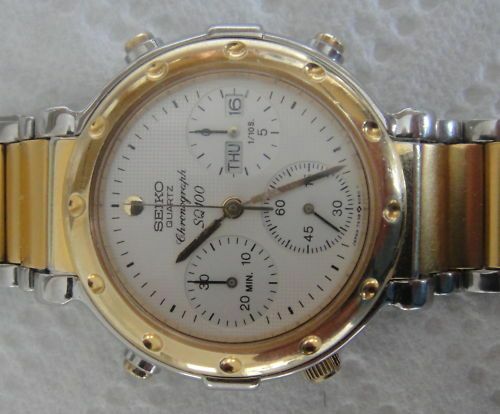 Again, if one wanted to source 'alternative' similar appearing bracelets from other Seiko models, apart from the equivalent stainless gold-plated two-tone 5P32-6A40, there's also the 8E22-0010, which on the face of it, is actually a ladies watch, but may possibly fit. 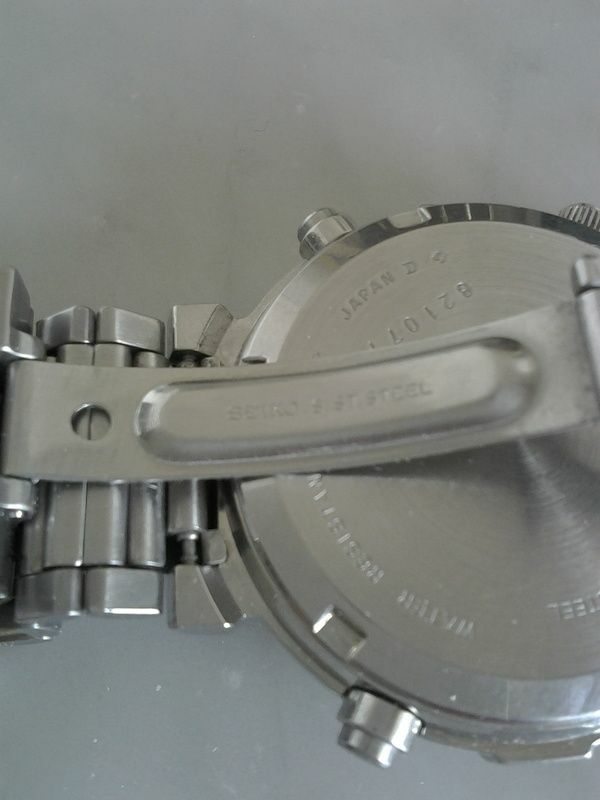 And so to the stainless white-faced 7A38-6090, which as Manuel implied - of these three variants is the least commonly found version. 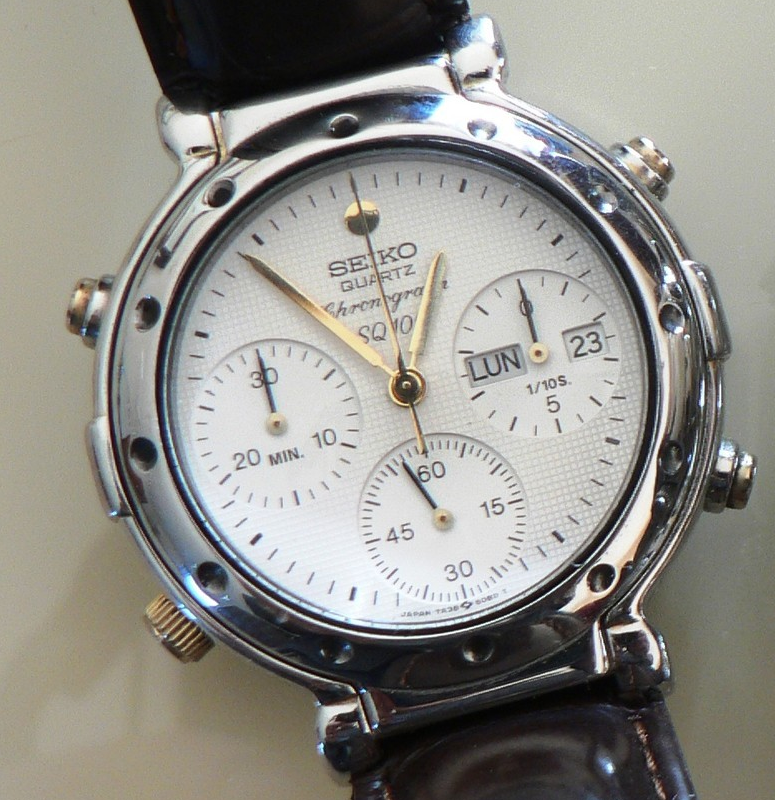 The first example I saw again belonged (and still does, AFAIK) to the erstwhile prominent US Seiko 7A38 collector Pete Pantelidis. 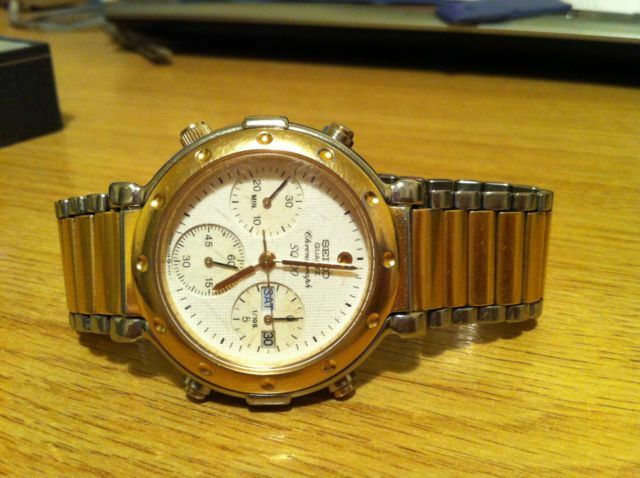 Great watch, rare piece. In working order. 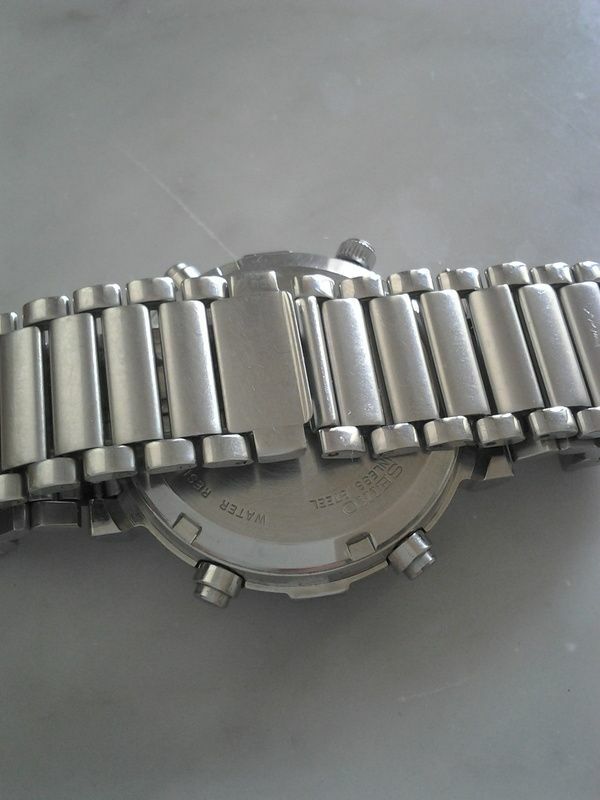 Bracelet needs fixing; little vis missing to retain the bracelet clip. 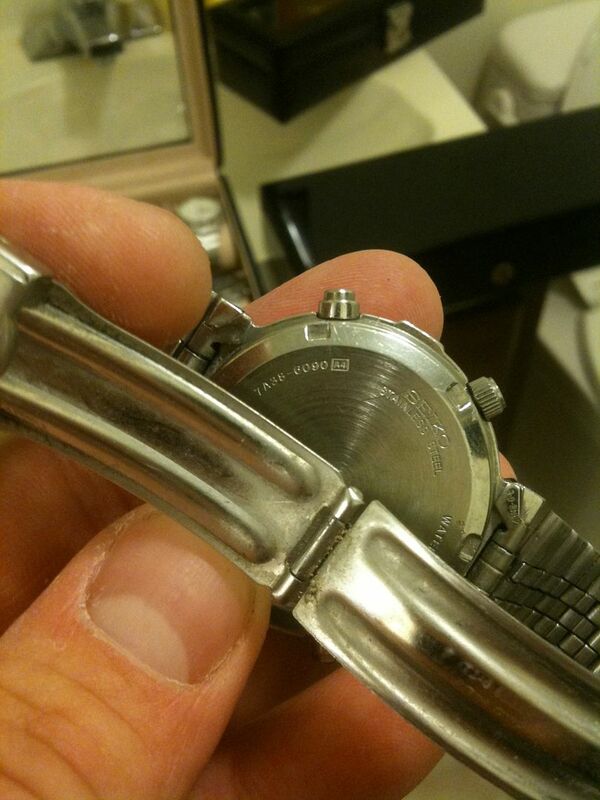 13 links and 4 removable adjustment links on one side and 16 links and 8 removable adjustment links on the other. That's mine. It also goes without saying it also needed a replacement crystal. Which brings us back up-to-date and Manuel's latest acquisition. Tempo fa mi è arrivato questo (dichiarato non funzionante). Con la scatola originale. Ottime condizioni generali. 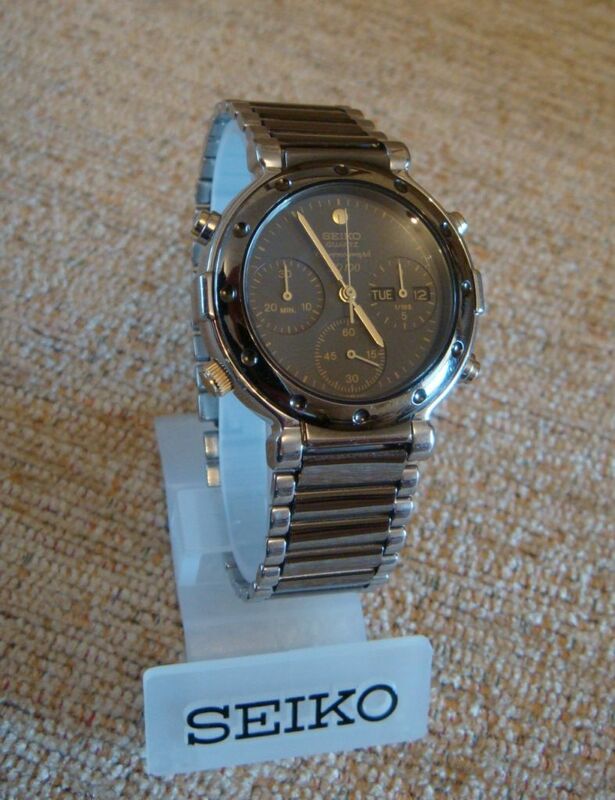 E' un seiko 7a38 6090, SQ100. Piuttosto raro, pochissime le info in rete. Appena posso faccio foto reali. Manuel's sentence: 'Piuttosto raro, pochissime le info in rete'. translates as: Rather rare, very little info on the Net. Hopefully between us, we've now rectified that. 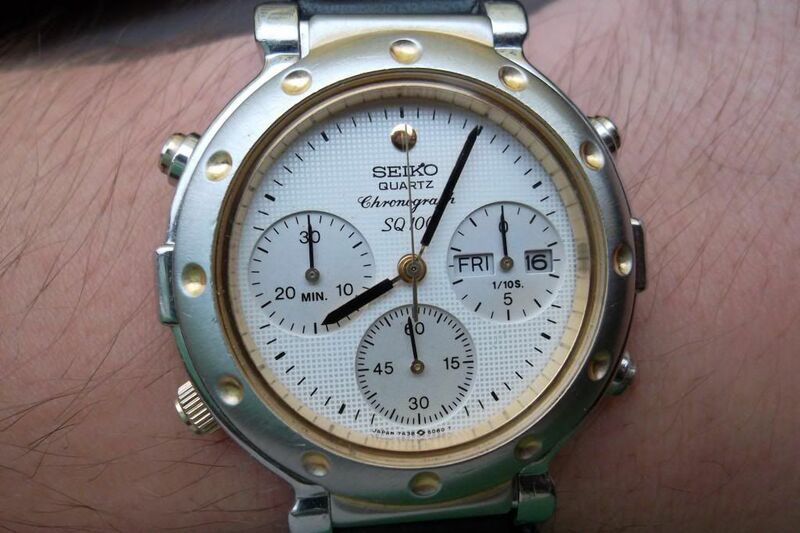 This morning I was browsing the internet in search for more information related to my watch and surprisingly I have seen a photo I have made with my Seiko posted here. That was a surprise. A nice one. 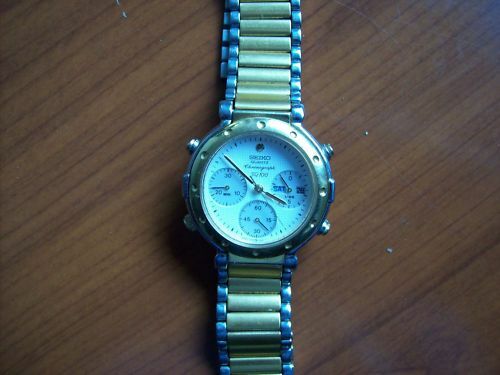 The photo was taken right after purchasing the watch in Bucharest, Romania. 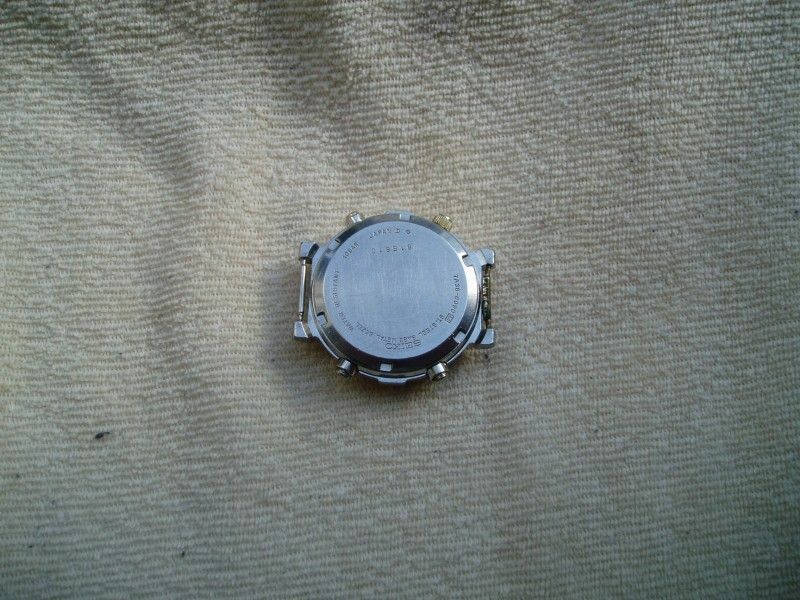 The watch had a "small" fault - the hour and minutes hands were not working at all. 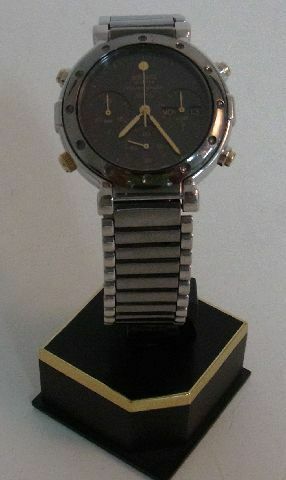 However I presented the watch as my latest acquisition on ceasornicar.ro , a wristwatches fans forum in Romania. 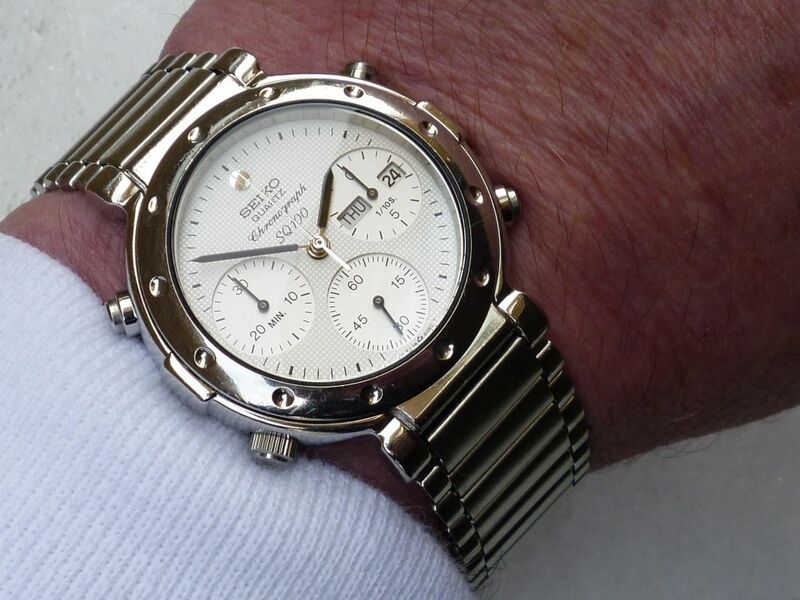 I should say that I do not know this watch' history but I do not think it it the same pointed in the previous photos, that has been sold on another site from Romania - it's similar but the hands are golden on that one while at my Seiko the hands are black. The glass is scratched at that one, mine's ok. 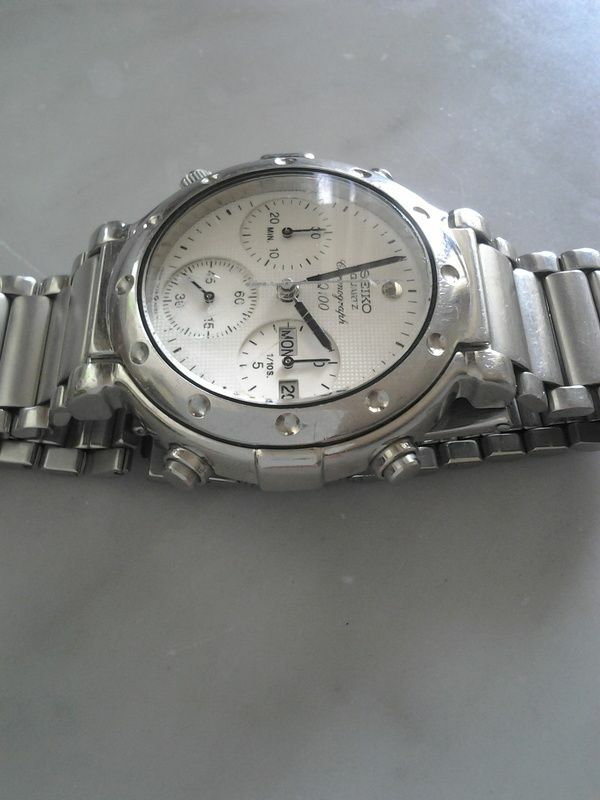 The guy who sold me this watch had another 7A38 like this but in titanium, more expensive. 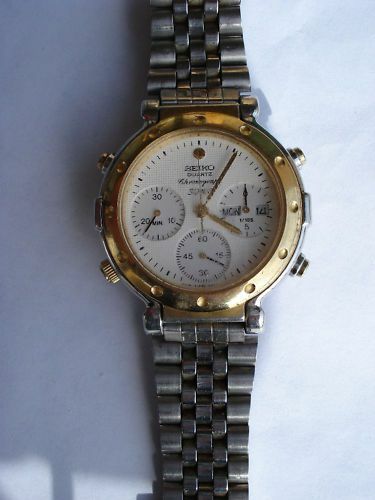 Alright, so if I compare the watches I saw here today I can see that my watch has been polished, the golden colour was taken out, the bracelet was replaced with a leather strap and so on. 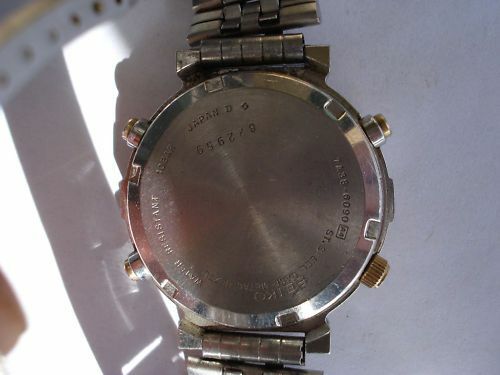 What I would like to ask you is: I could see with a magnifying glass that on the dial, on my watch it is written 7A38 6080 and on the back cover is 6090 - why is this? 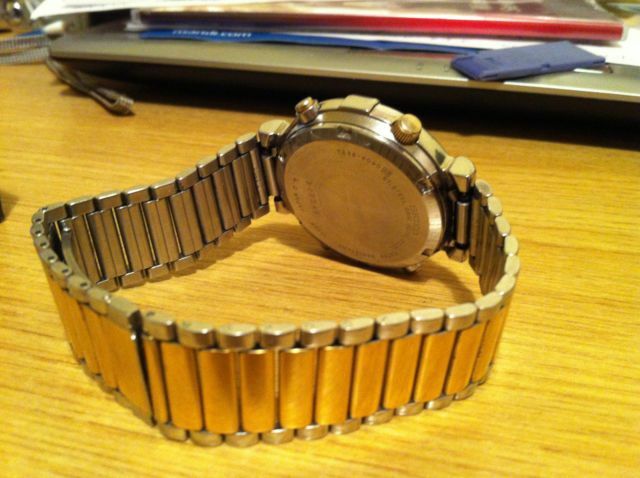 Is this a watch made from different watches? Also, I can see that the crystal glass is a bit different from mine, is mine a replacement one? 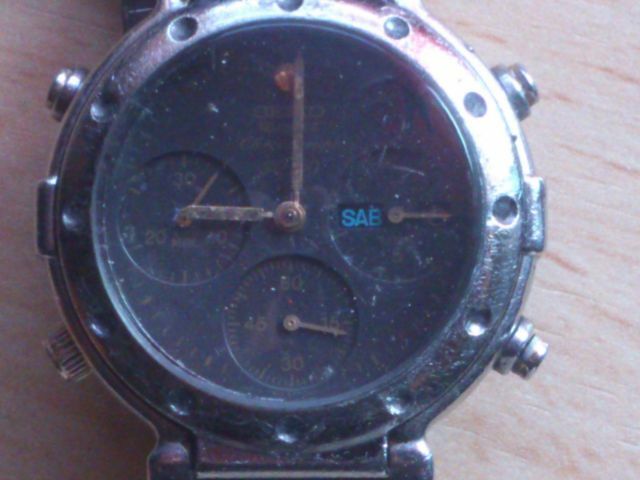 The serial number of my watch is 816810 - I could see that has been produced in 1988 in Japan. Is this correct? Also, I could see that almost all the other similar models have golden hands while mine has black ones. Why is that? 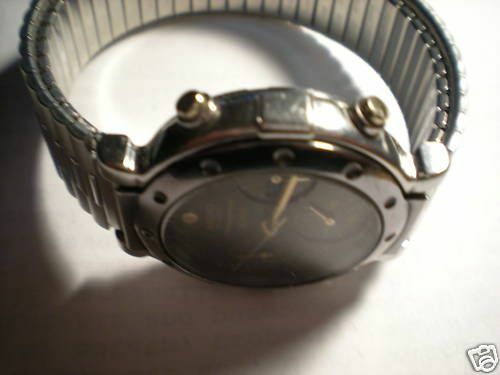 I am glad to say that I'm happy to see my watch posted here, I bought this watch a couple of months ago, a watchmaker repaired it and now it's working fine. 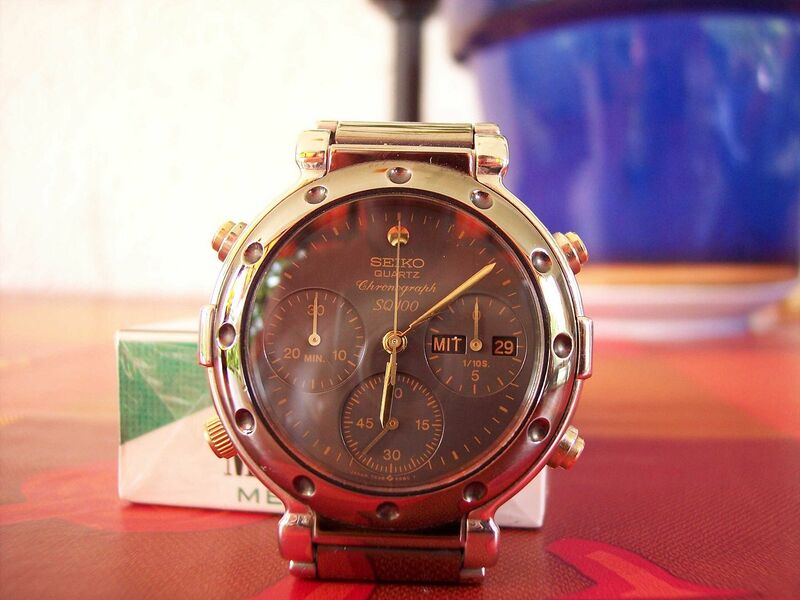 If you wish to see more photos with my watch, just let me know. Thank you in advance for your answers! Hello, Fredderik and welcome to our little forum. I'm glad that you found our topic of interest and were pleasantly surprised. 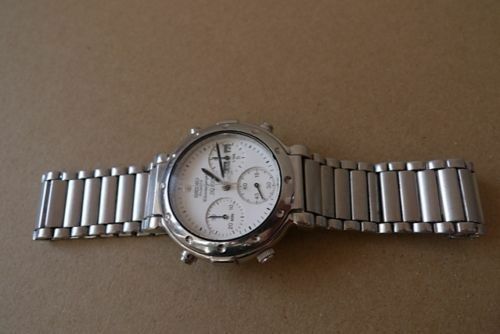 Please accept my apologies for my assumption about your watch being the same as advertised on Okazii.ro and Ceasuridemana.ro. 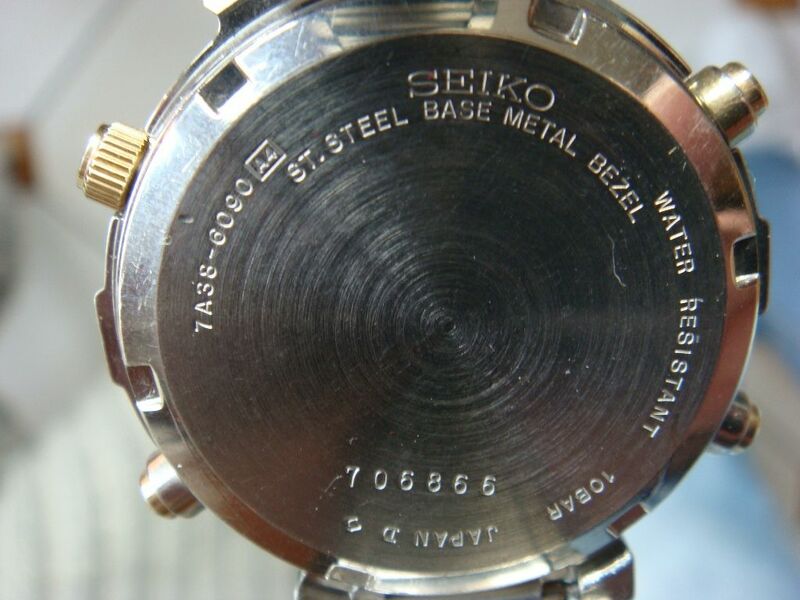 To answer your specific questions, if you look at the table(s), taken from Seiko's database, that I posted in my third post you will see that all 7A38-6090's have 6080Xxxx dial part numbers. 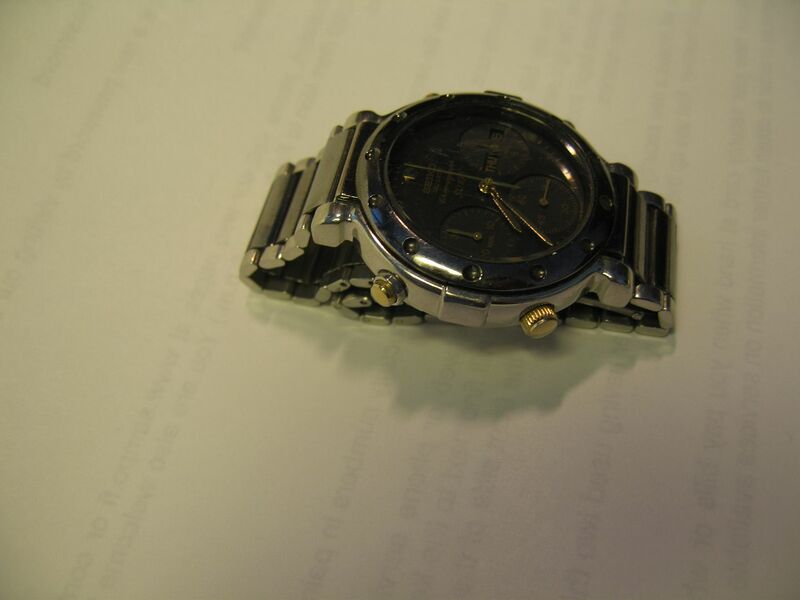 So this is also correct in the case of your watch. 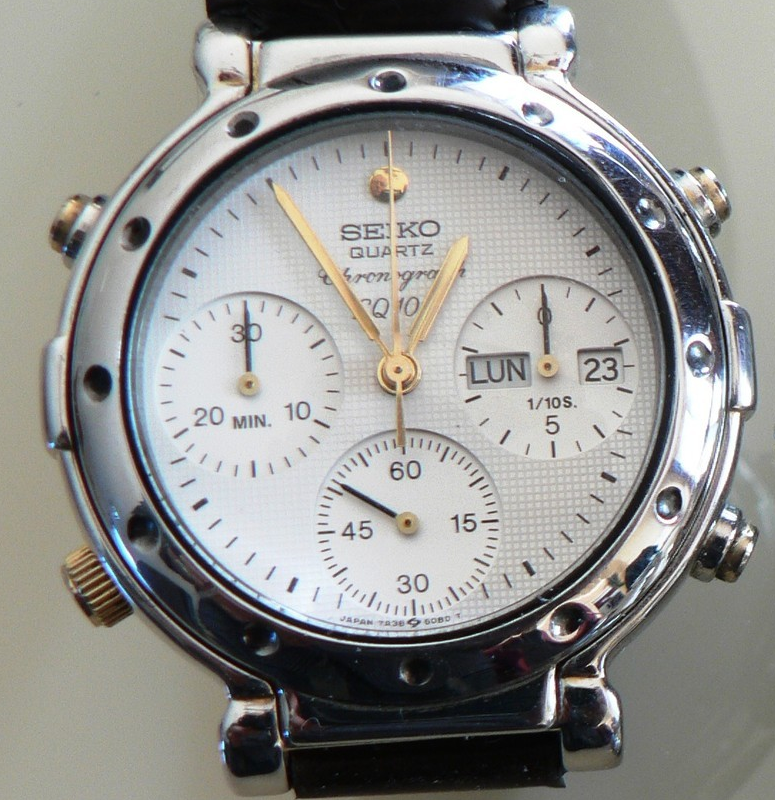 This apparent discrepancy occurs throughout the Seiko 7Axx range and confuses many people, particularly newbies into thinking their watches may be 'franken'. 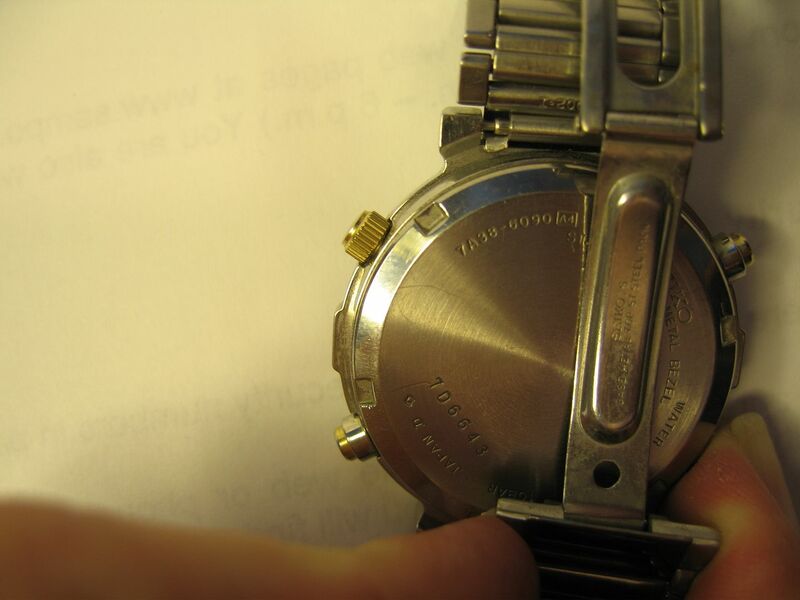 The hour and minute hands on your watch appear to be the correct style. 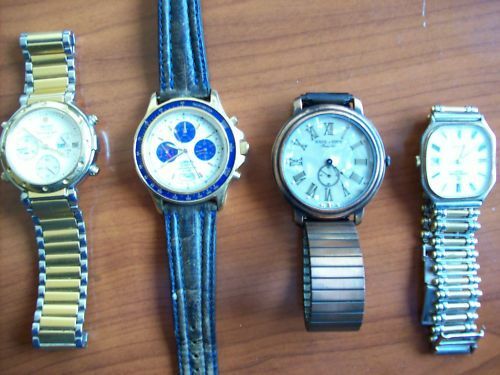 They may originally have been gold plated. 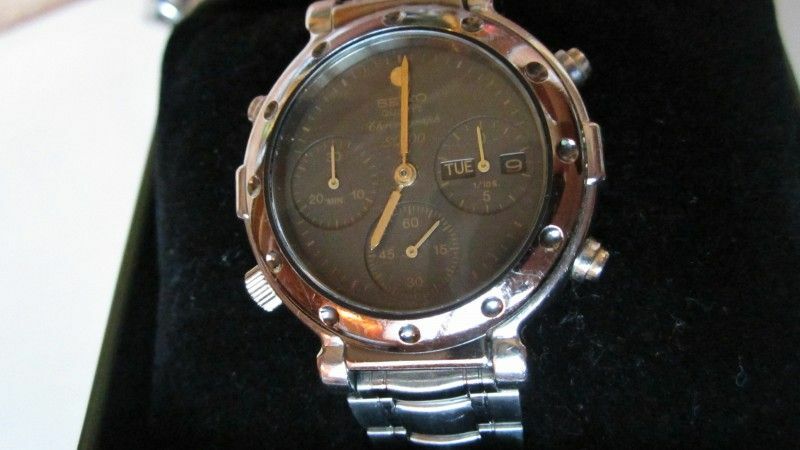 Perhaps they became tarnished - see the example above that was listed on eBay in June 2011, subsequently purchased by 'Paul66' on RLT (a.k.a 'BlackCab' on this forum). 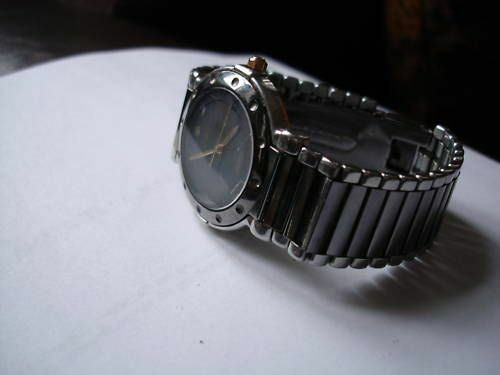 Note that watch's hour hand is tarnishing. Perhaps somebody decided to paint them black to improve their appearance. Alternatively, maybe it was done deliberately, for improved visibility at the behest of a previous owner. Who knows ? As regards the crystal, it's quite possible that yours is fitted with a 'generic' replacement glass. The domed crystal on a 7A38-6090 sits quite proud and hence is prone to getting scratched easily. 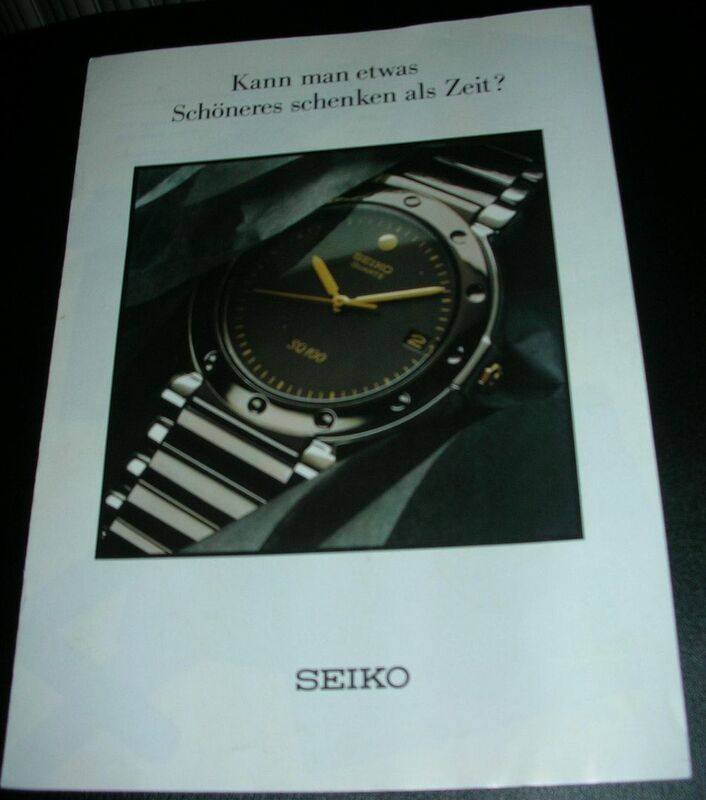 The original Seiko crystal p/n 275W30HK01 is now obsolete and no longer available, but Sternkreuz make an exact equivalent, their p/n XMF275.701 which I have also used - and you can't tell the difference. Oh - and I nearly forgot. You are correct. 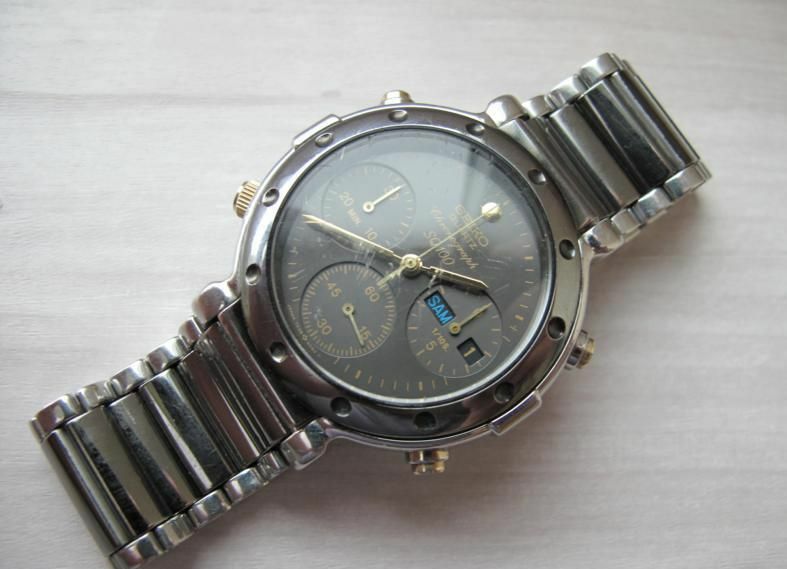 Your watch's serial number 816810 signifies that it was manufactured in January 1988. Reserved for Specification and Buyers' Guide. In the light of Fredderik's questions above, it appears I need to get this post written up soonish ! Thanks a lot for answering all my questions. 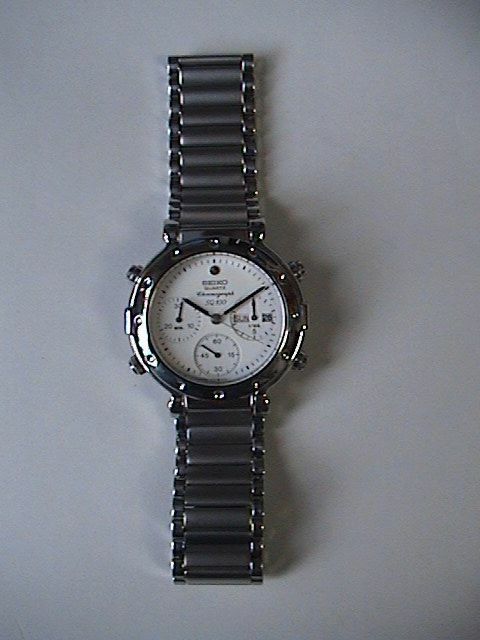 I'm glad to own a little piece of quartz history, although I'm more attracted to the mechanical watches. 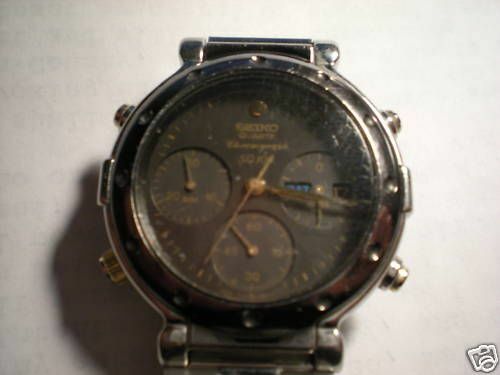 When I first bought it, I showed this watch to a Seiko connoisseur and he replied to me: You know you have a legendary quartz movement, right? I didn't know at the time. Now I'm aware of it. Sorry if I ruined the thread with my intervention, not intended. 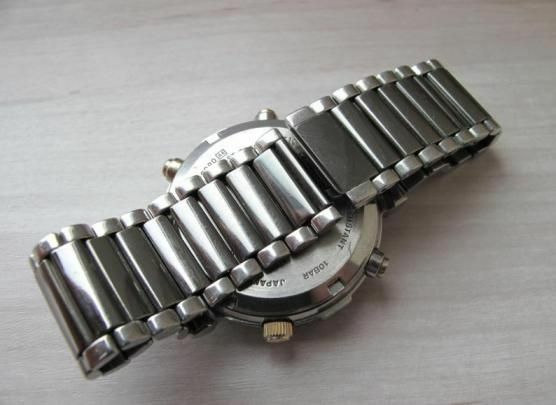 You've made an awesome job with this site, is one of the few wristwatch forums dedicated to a single movement. Nothing is 'ruined' by your little 'intervention', intended or not, Fredderik. Au contraire - I regard it as another welcome contribution. Perhaps in time, we'll convert you from mechanical watches to being a connoisseur of the World's First and Best quartz chronograph. Converted in Euro the price would be somewhere around 50 Euros. 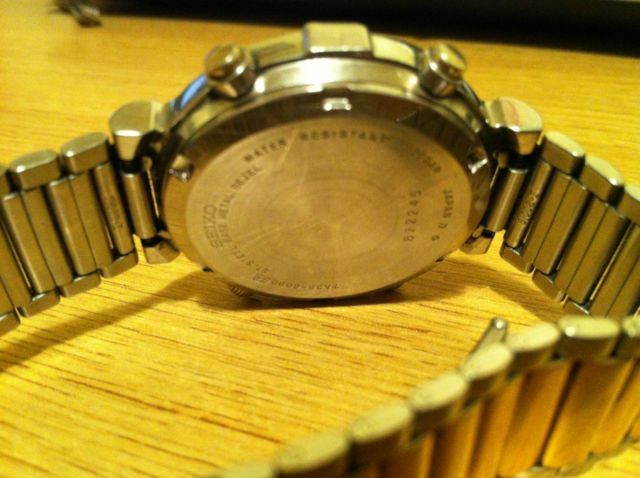 It's missing the sweep second hand; the hour hand has also been bent (and 'straightened'), and fitted with a non-original bracelet. Just remember, I only paid 30.50 Euros for mine. 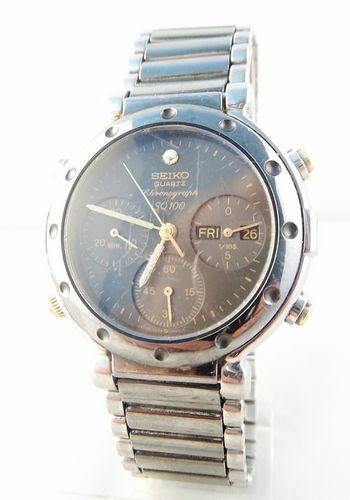 I'm not saying you're guaranteed of finding one at a cheaper price, but this model is relatively common on eBay Germany; there are certainly better examples of this version of 7A38-6090 out there, waiting to be found. The gunmetal two-tone variant is beautiful. 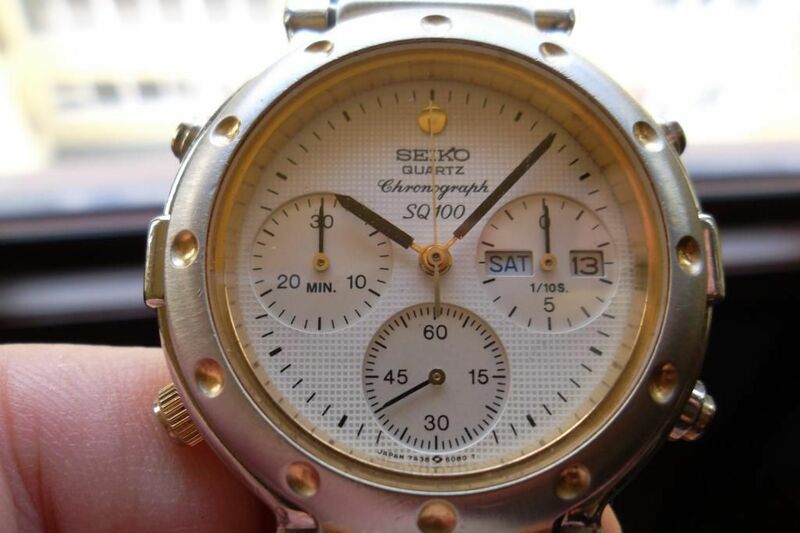 According to you, Paul, logo SQ (in this version) means, Seiko Quartz or Superior Quality? Manuel. Actually I think it's the least attractive. It's quite hard to capture it's true colour and texture, but the dial looks sort of an glossy oily plastic (rather than painted). 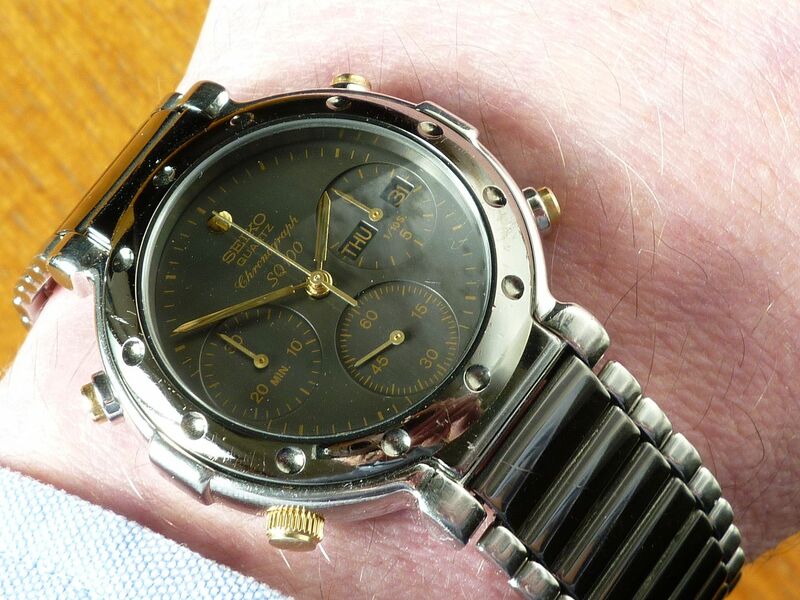 The 'waffle' finish dial in the stainless and stainless / gold two tone is much nicer, IMHO. 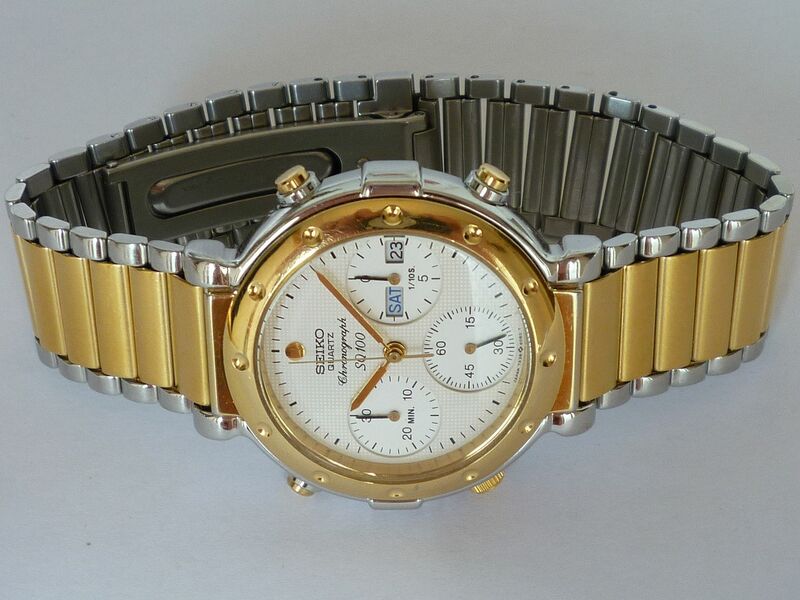 My favourite version is the stainless / gold two-tone. 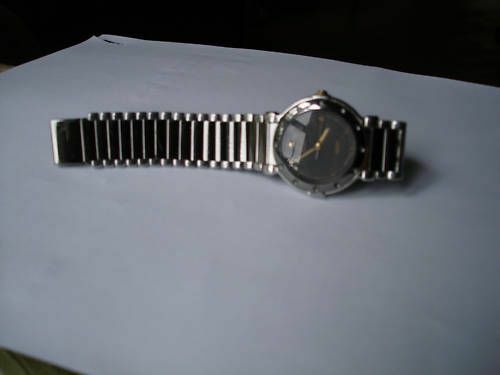 As far as I know 'SQ' has always stood for Seiko Quartz. 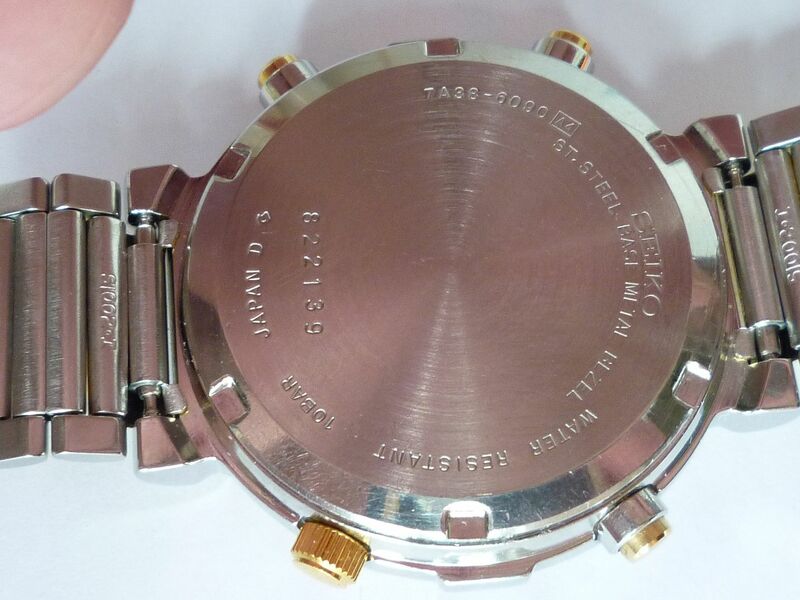 In the case of 7A38's it can also be interpreted as 'superior quality'. 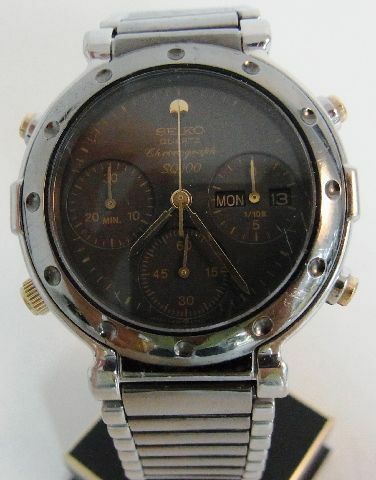 Here's a really battered example of the stainless / gunmetal coated 7A38-6090 currently listed on eBay. Thanks to James for the link. 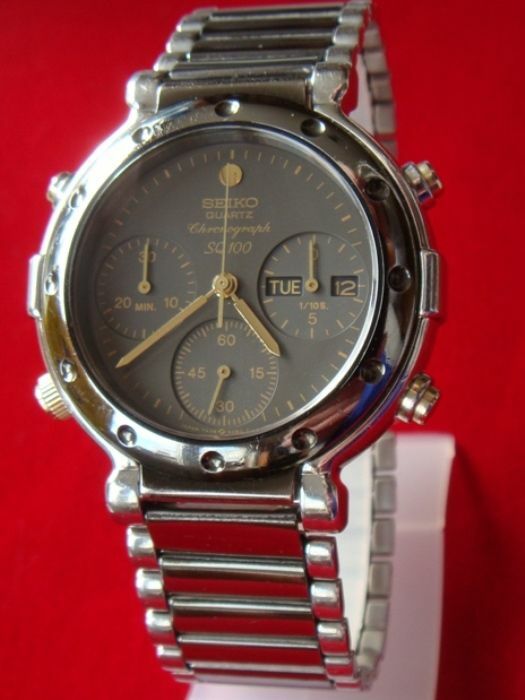 seiko cuarzo el reloj funciona pero caja y cristal rayado para piezas. I suspect it wouldn't be worth 49 Euros to anybody, even the desperate / most experienced tinkerer - for spares or anything else. Well there's one on ebay if you're interested. There's confidence for you ? 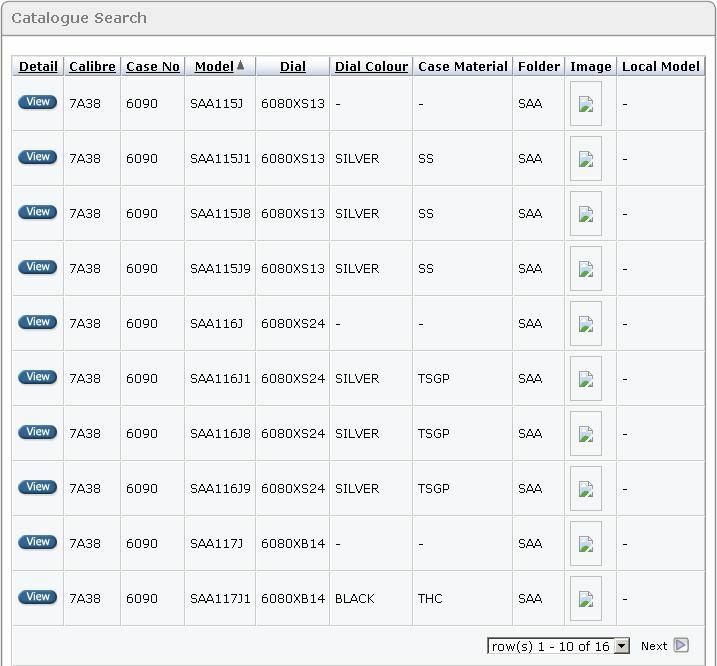 In case you'd failed to notice, that's the same 7A38-6090 which Fredderik (Bonheur) wrote about above, in his post dated 29th May. 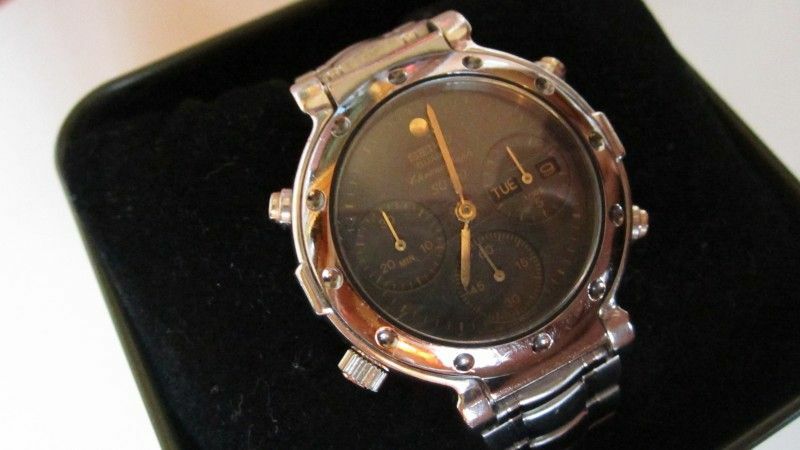 It still managed to attract a hapless bidder at the $123 opening bid price ! 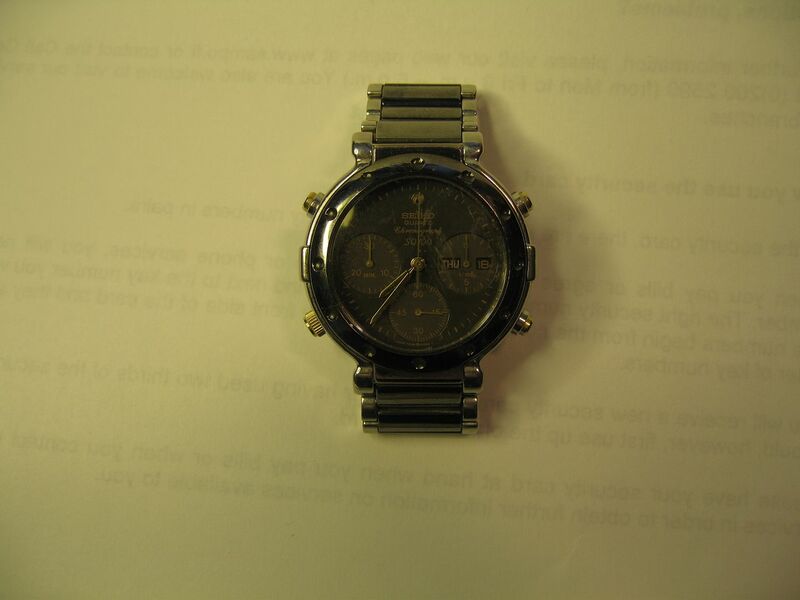 I must admit, I was more than a bit dubious about that auction result when I posted it, particularly given the poor condition of the watch. Something rather more interesting popped up on eBay today. -Cadran blanc 7A38-6090 verre neuf bracelet remplacé. Date en français et Anglais. Le boitier a été poli, à l'origine il été doré. 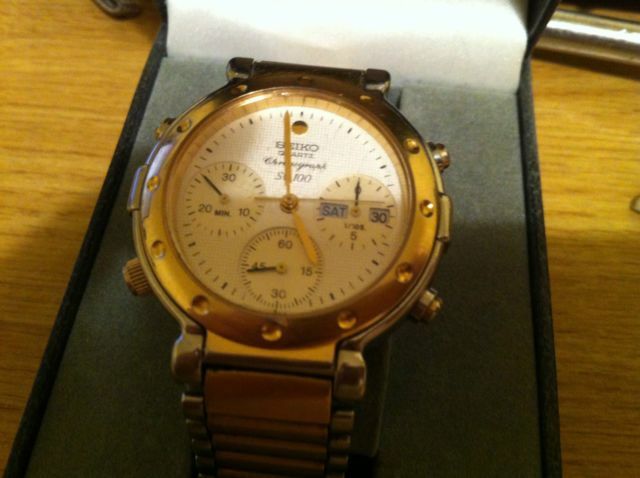 The case has been polished; originally it was gold plated. 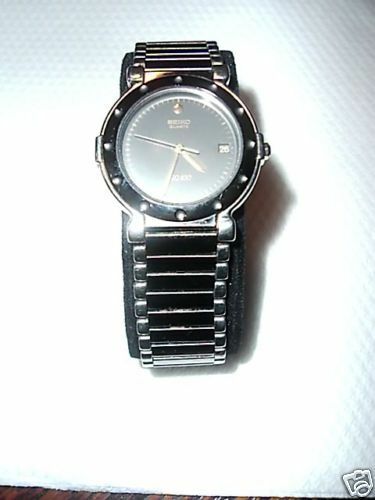 Its original two-tone bracelet has been replaced with a leather strap. 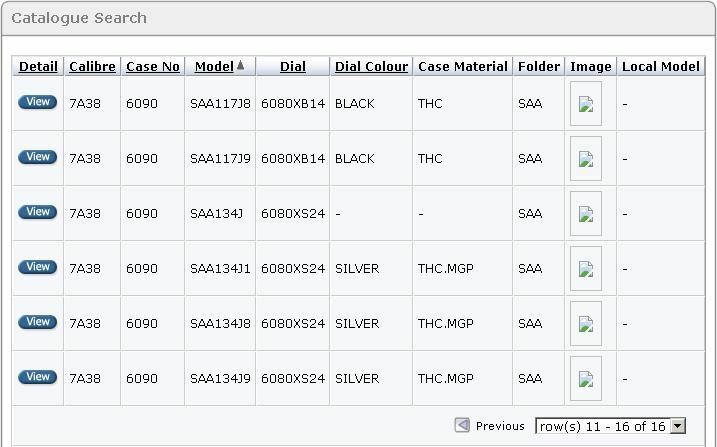 So what we're looking at is what's left of / a not very original example of a 7A38-6090 SAA134J. But at least they do exist. 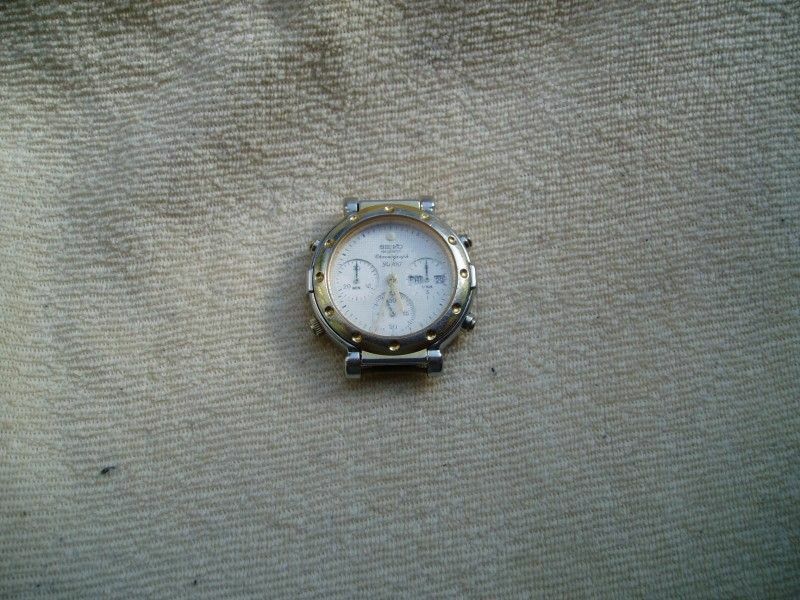 ...........................just replaced the battery and min/hand seems to be working although i do not realy understand how a chronometer works, i think the problem is getting the correct battery fitted. My apologies for not remembering who you were, but I wouldn't have recommended this particular example (to anybody) anyway. (I've only bothered posting 5 of the 10 included in the listing) - indicating either possible previous battery leakage or moisture ingress. Live in Key West. 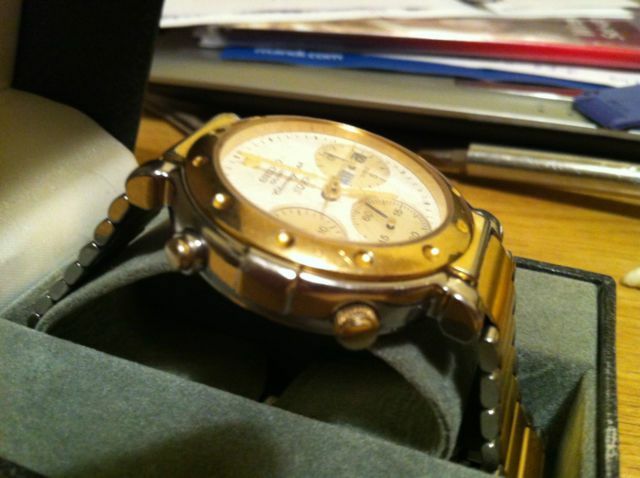 I have a gold 7a38-6090 which needs new guts inside. I am hoping to secure a similar one to make one out of two.